In analogy with antibiotic therapy, we must take into account the compounds, the pharmocodynamic and pharmakokinetic properties of different fluids and should consider the "four D’s" of fluid therapy when treating patients with septic shock: drug, dosing, duration, and de-escalation. 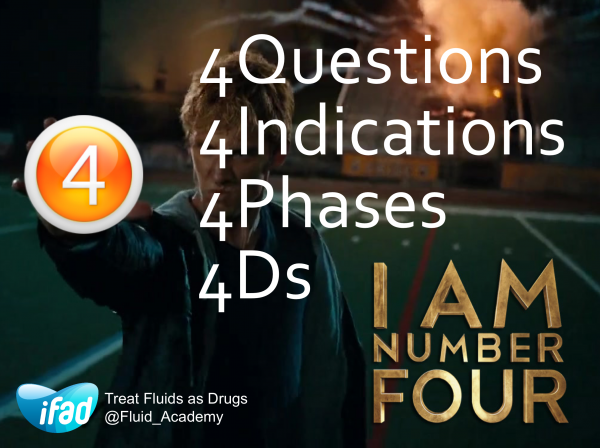 There are only 4 indications to give IV Fluids: for resuscitation, for maintenance, for replacement and finally for nutrition. Clinicians should be ware of the 4 phases of fluid theraoy. First comes Resuscitation, this is about to save lives. Next optiization and organ support. Third phase is stabilization and finally comes evacuation (or de-resuscitation). In this lecture given by @manu_malbrain during the 38th #ISICEM18 meeting held in Brussels the above mentioned concepts will be explained and discussed.